Kurban-bayram (Feast of Sacrifice) in Russia! Today Muslims all over the world celebrate the most signification holiday Eid al-Adha also called “Festival of Sacrifice” and we know it in Russia by name Kurban-bayram. This holiday is dedicated to Ibrahim who was ready to sacrifice his son to obey God. When all was ready for sacrificing God allowed Ibrahim (Abraham) to sacrifice an animal. This holiday remind people to remember about sacrificing, sacrificing and help poor people.. In Russia we celebrate the holliday too. 8 regions even have this day (Friday) off for people to celebrate the Feast of Sacrifice. 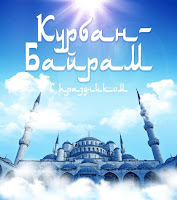 For our readers who want to know more about Kurban-bayram in Russia we publish an interesting documentary video: Kurban-bayram in Russia, 1945. This entry was posted in Documentary, Religion on November 27, 2009 by admin. Pingback: Russian Video: Kurban-bayram in Russia (1945)!